USDA Allows Rubashkin Meat Hook Use to "Facilitate Bleeding"
Documents (posted below) obtained by FailedMessiah.com under the Freedom of Information Act show that the USDA now permits probing or excision of an open ritual slaughter wound using a meat hook, even though the cattle this procedure is perfomed on are fully conscious at the time the procedure is carried out. 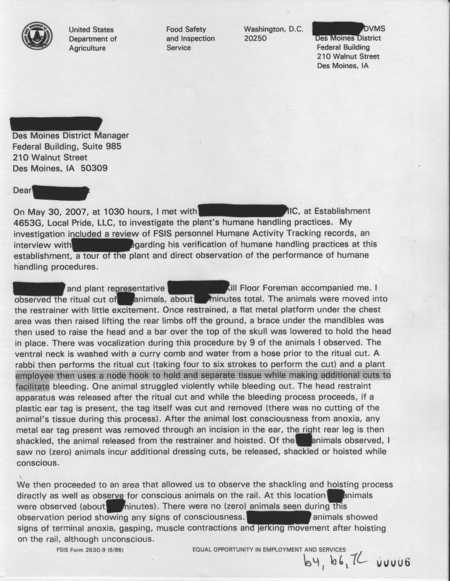 Further, even though internal USDA documents, made public here for the first time, show the USDA expects a "rabbi" will perform the meat hook procedure, in practice the USDA allows any plant employee, Jewish or not, trained or not, to carry it out. 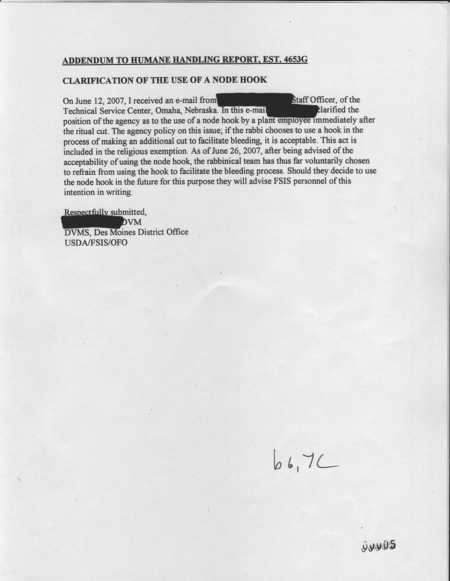 The USDA ruled in an internal document (posted below) dated June 12, 2007 that use of a "node hook" (a small meat hook often called a boning hook) by a "rabbi" to "facilitate bleeding" falls under the religious exemption for ritual slaughter and can be done to fully conscious cattle. 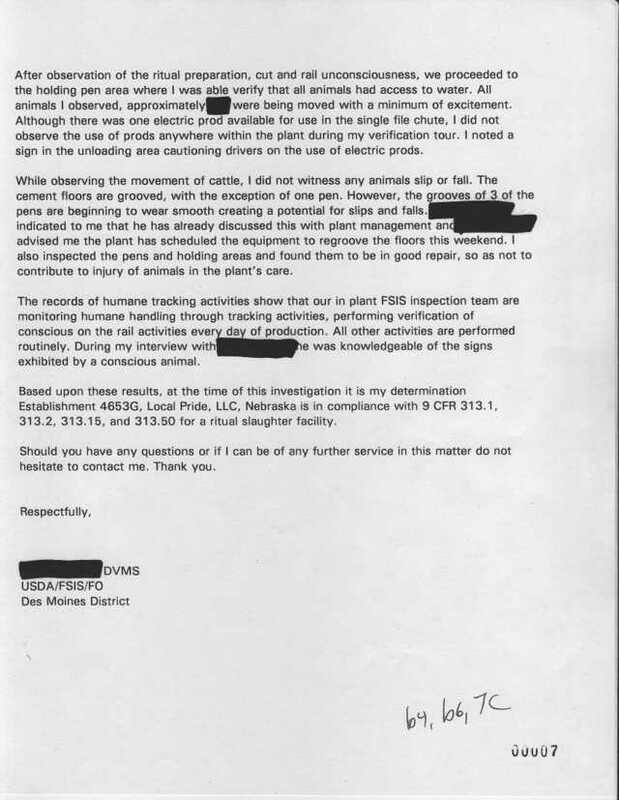 The USDA was responding to complaints generated by a PETA undercover video taken at Rubashkin's Gordon, Nebraska, Local Pride, LLC plant. That video showed a non-Jewish worker probing the open throat wounds of fully conscious cattle with a meat hook seconds after slaughter. 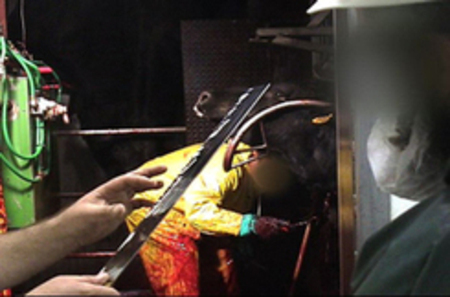 The OU promised more than three years ago to stop using meat hooks in the open throat wounds of animals. When caught using a smaller meat hook this spring, the OU denied a meat hook was used. Yet clearly a meat hook was used. The USDA documents posted below note the plant has agreed to stop using the "node hook" and will not resume using it before notifying the USDA FSIS. There is no provision made to notify consumers about the use of the "node hook." [A]t certain times, an instrument was used by a plant employee designated by the rabbi as a means of facilitating bleeding. Clarification of the acceptability of this practice was sought and it was determined that this limited practice was acceptable as it is within the religious exemption provided for in the HMSA. Such a procedure performed by the rabbi is covered by the exemption or "bubble". Once the animal is rendered to a state of complete and continuous unconsciousness, plant processing of a ritually slaughtered animal may begin. This summer, when the PETA video of Rubashkin's Gordon plant broke, Rabbi Seth Mandel of the the OU told me that the USDA had ordered throat probing with the meat hook, not the rabbis. This was false. 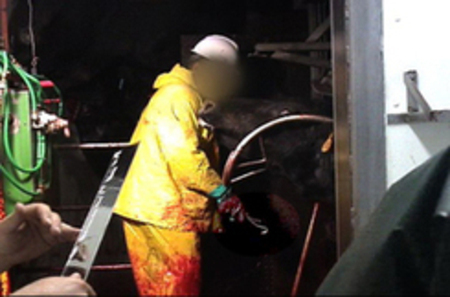 Rabbi Mandel also claimed the procedure was not a part of the ritual slaughter process. [F]rom the moment the animal enters the slaughter box until the moment it is removed from that box, the USDA has nothing to say or do about what takes place. The USDA, Dr. York [said], does "not interfere with glatt kosher slaughter." Of course, this was not the position of the USDA under any previous administration. As first reported here more than three years ago, rabbis – including leaders of the OU, Star-K, CRC (Chicago), and Agudath israel – successfully lobbied the Bush Administration in October of 2003 to have directives covering ritual slaughter weakened. The Bush Administration not only did what the rabbis wanted, it did more than the rabbis asked for, making it almost impossible for on site FSIS inspectors to stop a glatt kosher production line. 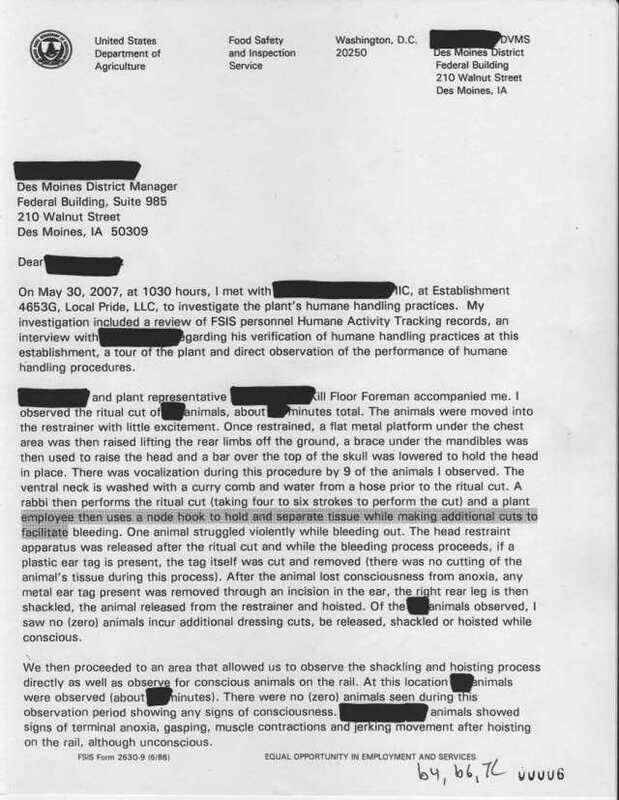 Indeed, under the formulation found in these newly obtained USDA FSIS documents, it would seem possible that even the egregious throat-ripping done at Rubashkin's Iowa plant and uncovered by PETA would now be considered humane by the Bush Administration's USDA. 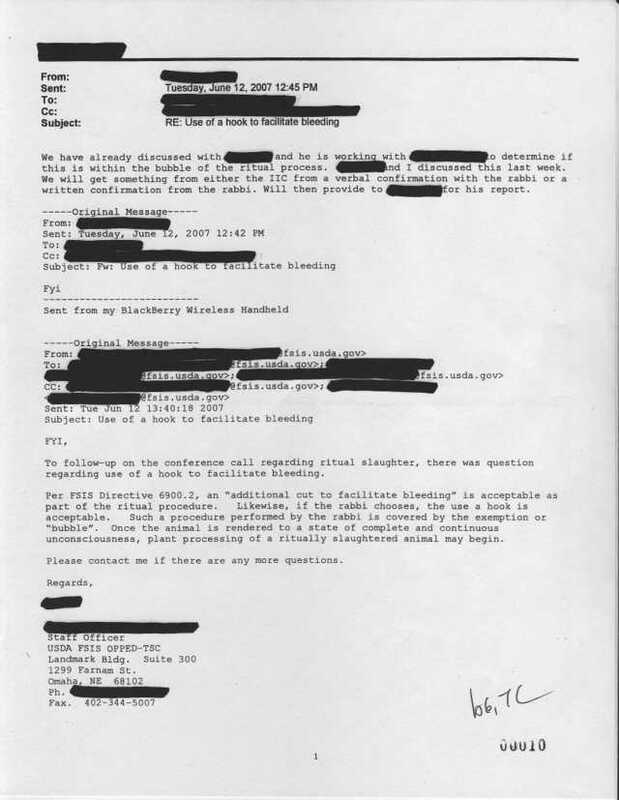 Most of the documents are posted below as JPEGs. The complete set of documents is posted as a PDF file at the very bottom of the post. If you're posting on this, please make sure to link to the post itself and not to the specific document. Also please make sure to credit FailedMessiah.com with a full, working link if you use any of the documents or the PDF.